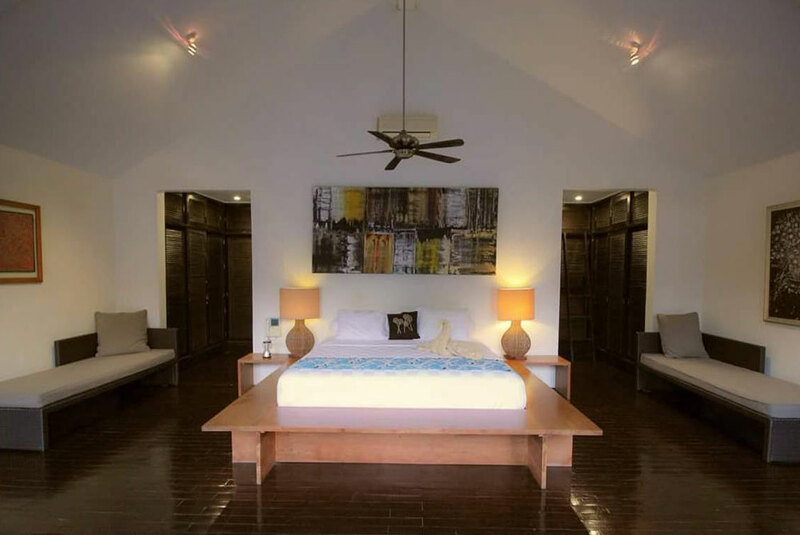 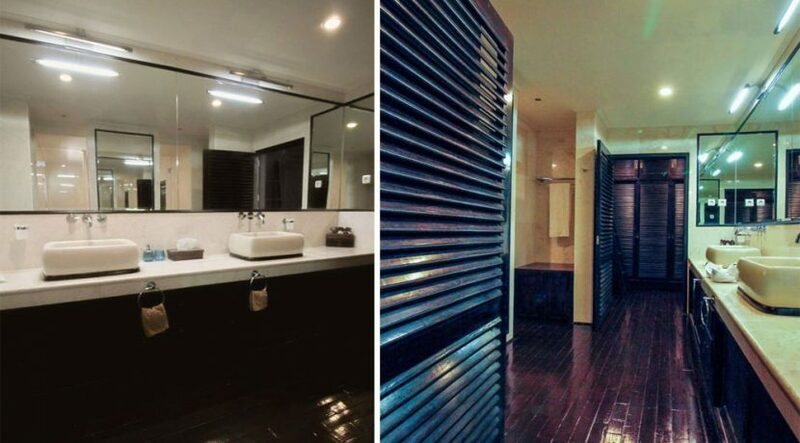 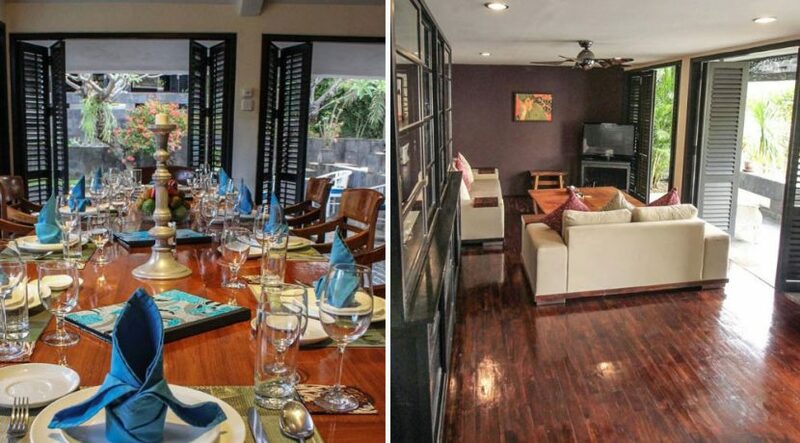 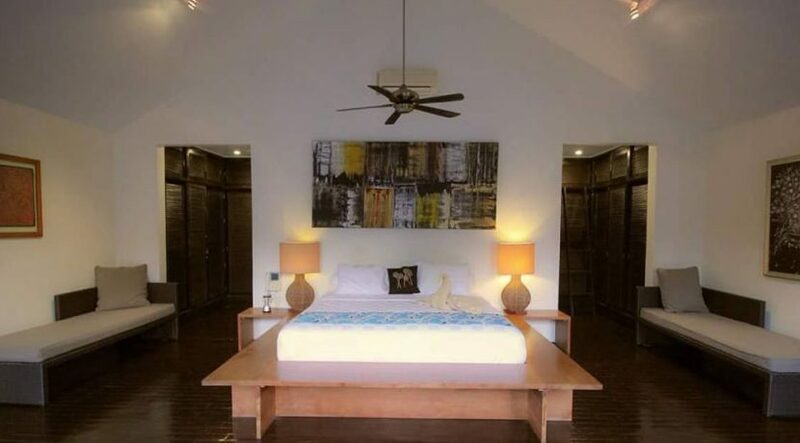 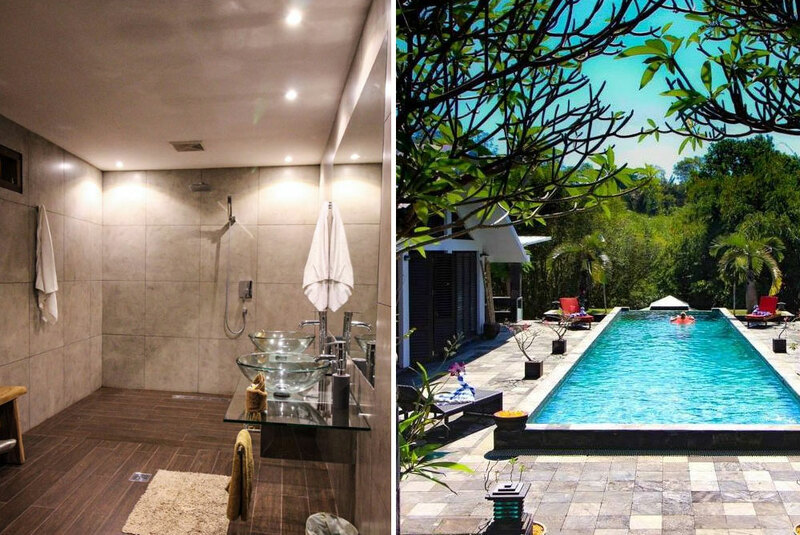 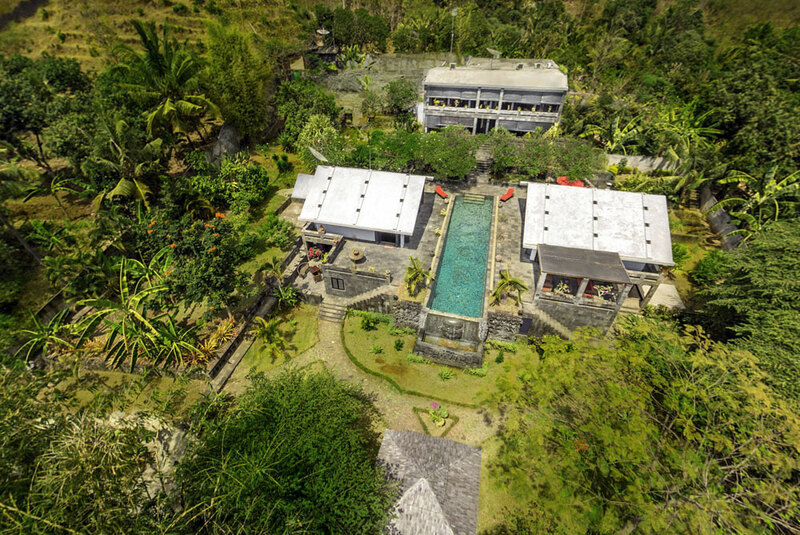 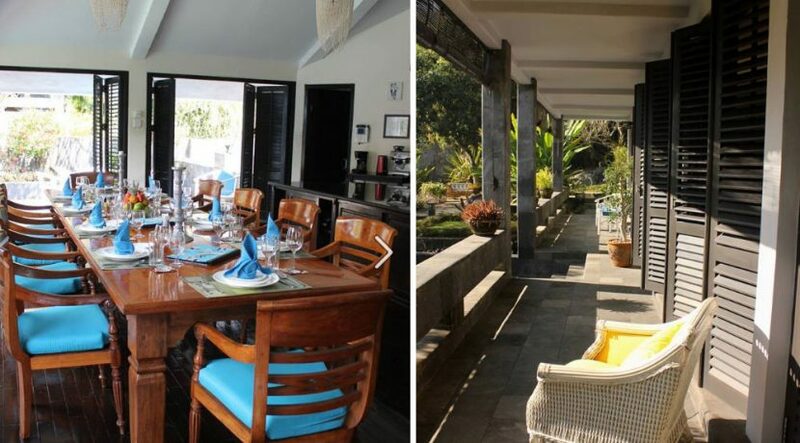 This totally unique villa was built by a European builder to the highest standards of construction & finishes and is located in a beautiful valley just 2 km uphill of the famous tourist town of Lovina. 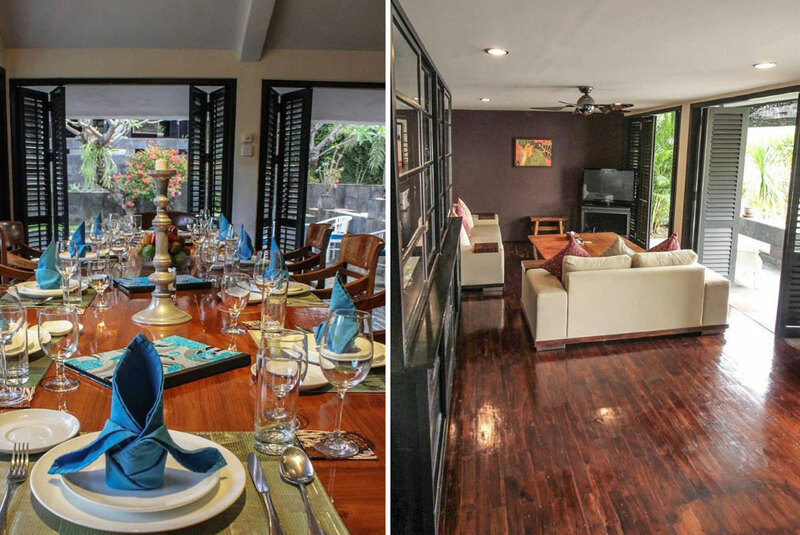 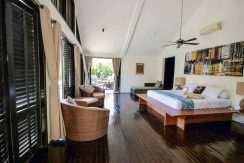 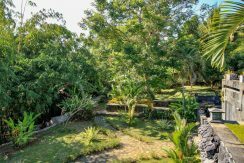 The villa surroundings are exceptionally quiet and private because it is in the middle of tropical trees and even a small river runs at the foot of the property. 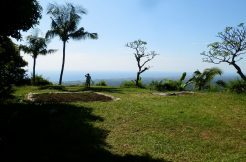 The location is called Kayuputih. This villa is so exceptional that you won’t find another villa like it. 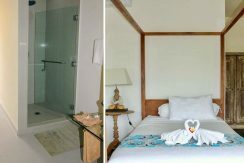 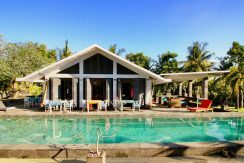 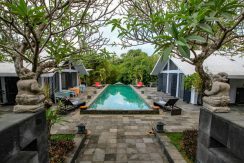 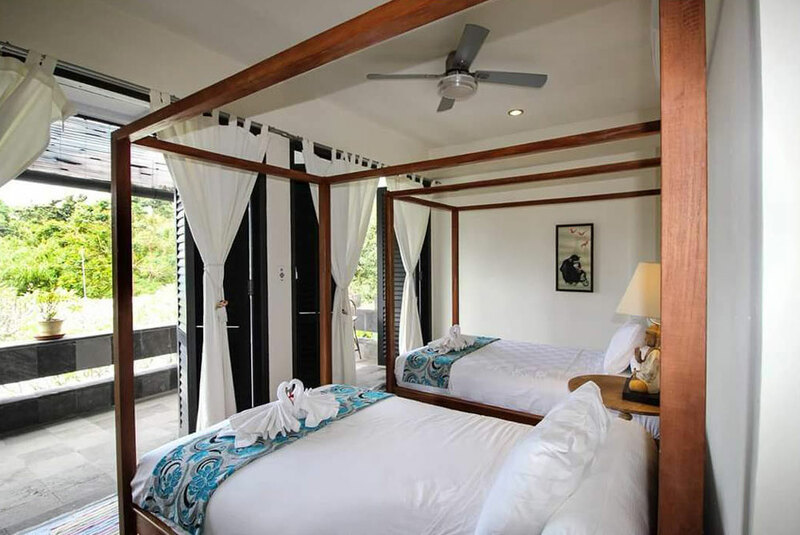 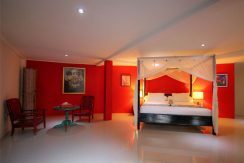 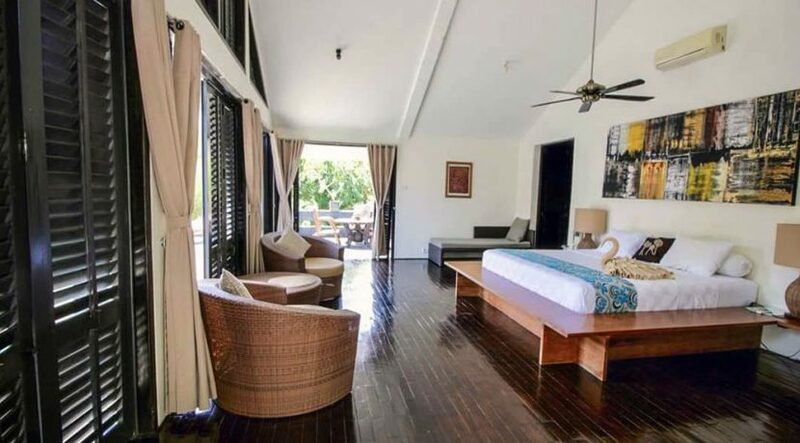 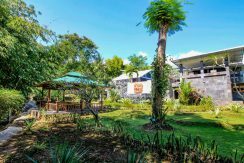 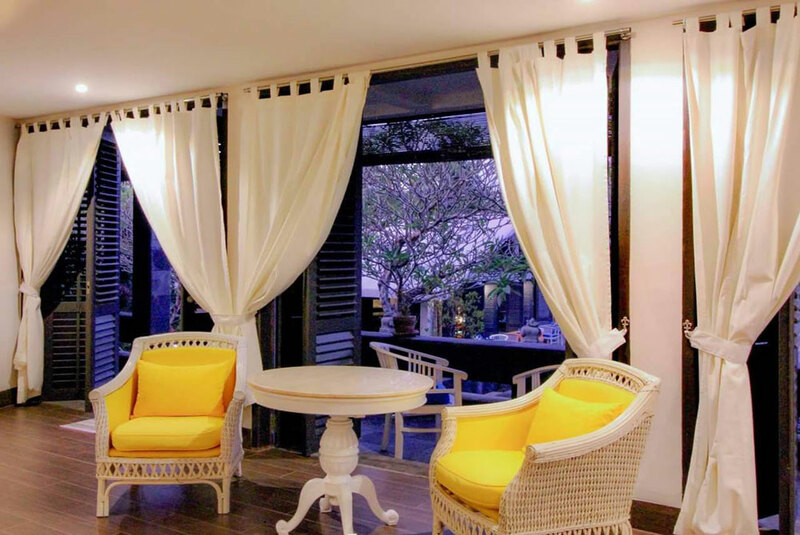 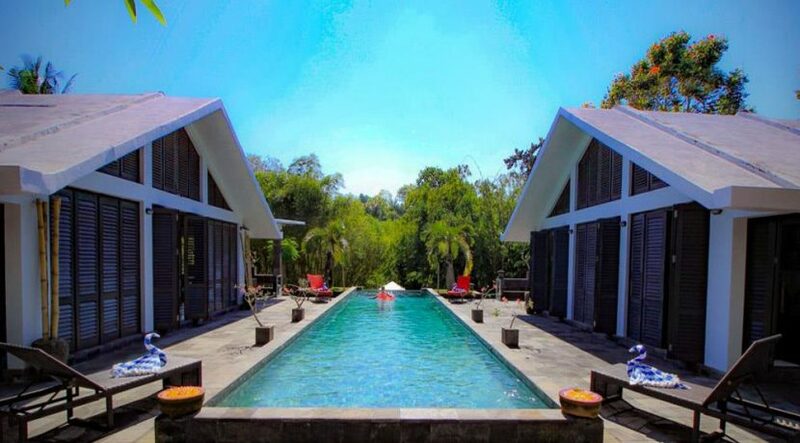 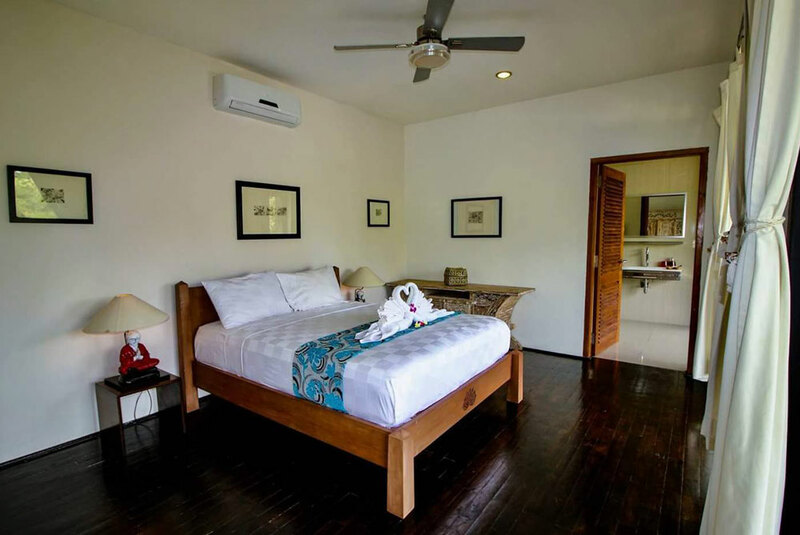 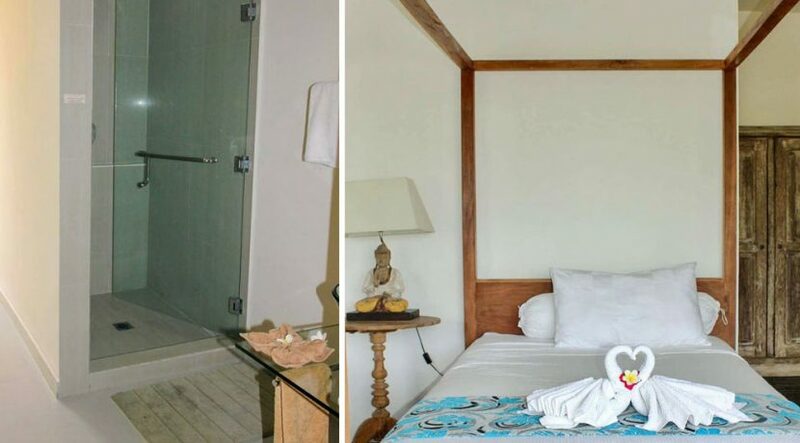 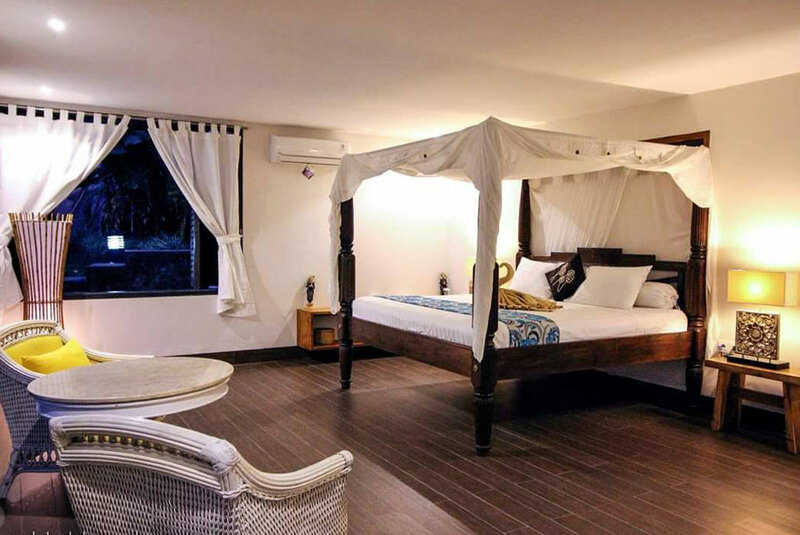 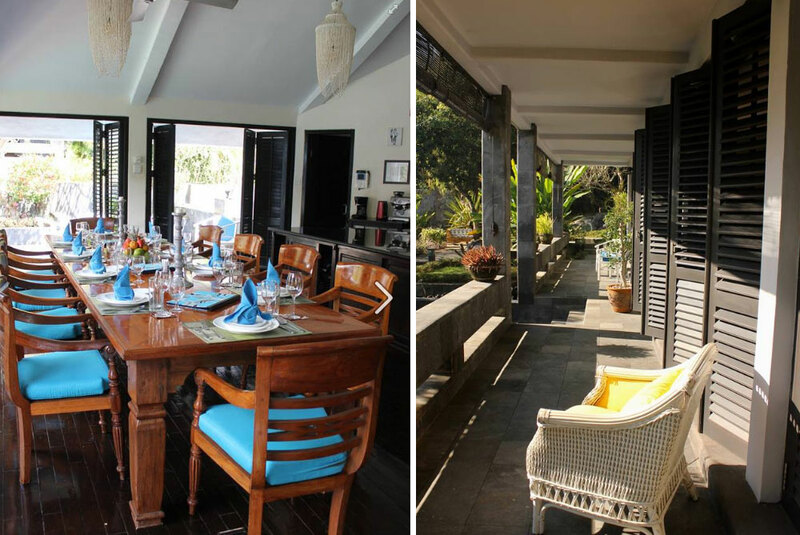 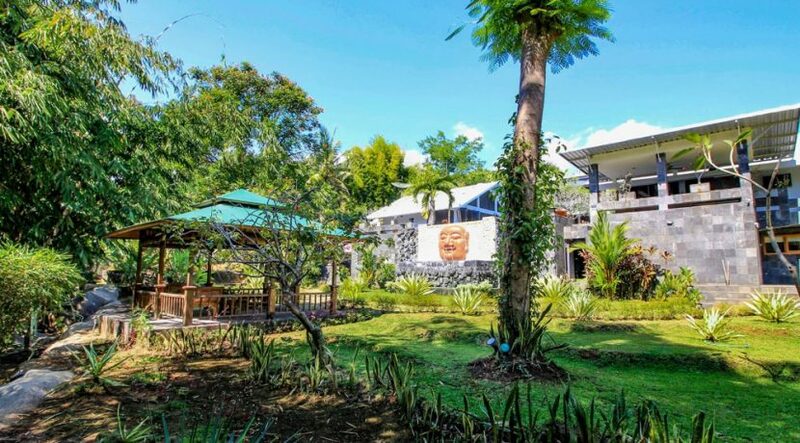 Three buildings, six separated bedrooms, all en-suited & air conditioned, a huge swimming pool and most of all a breath taking view over the forest nearby and Lovina. 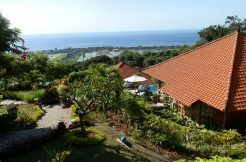 From the roof you have a view over Lovina & the ocean. 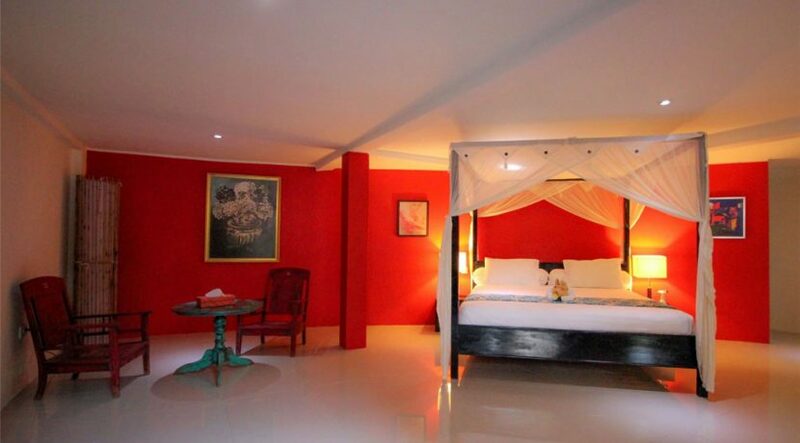 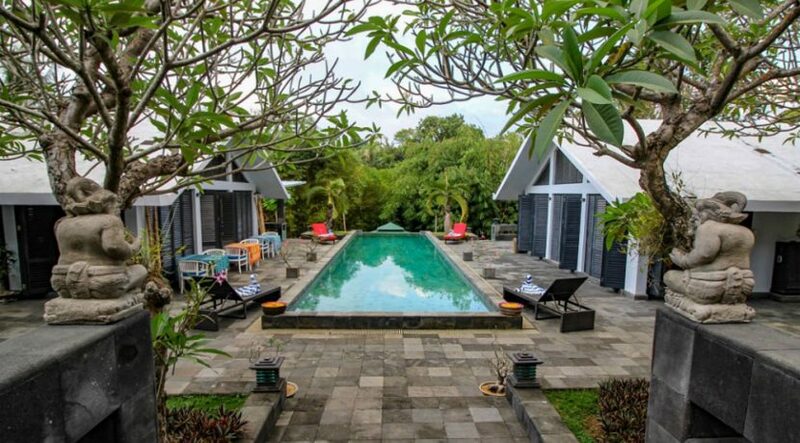 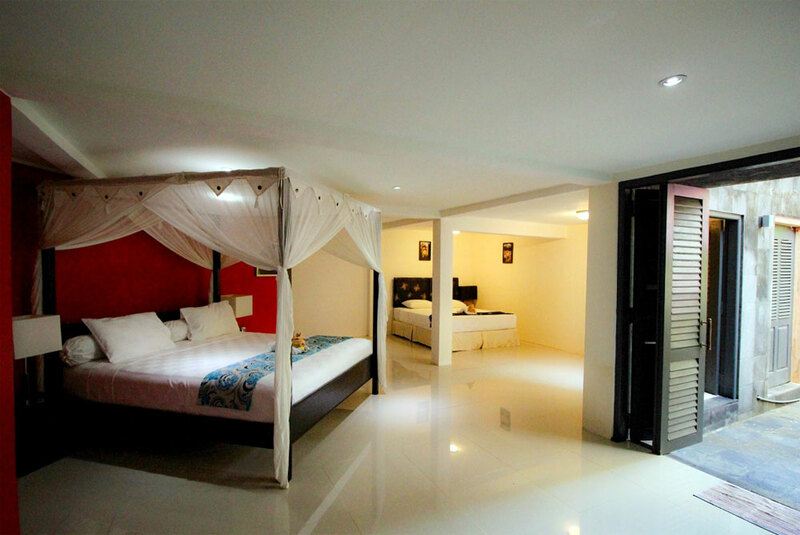 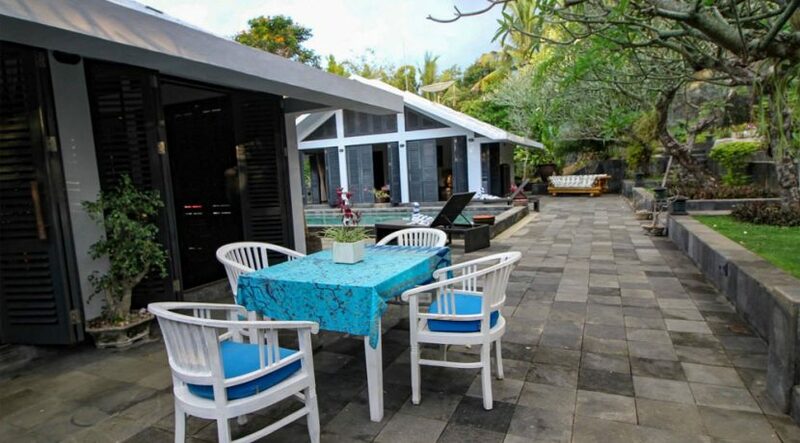 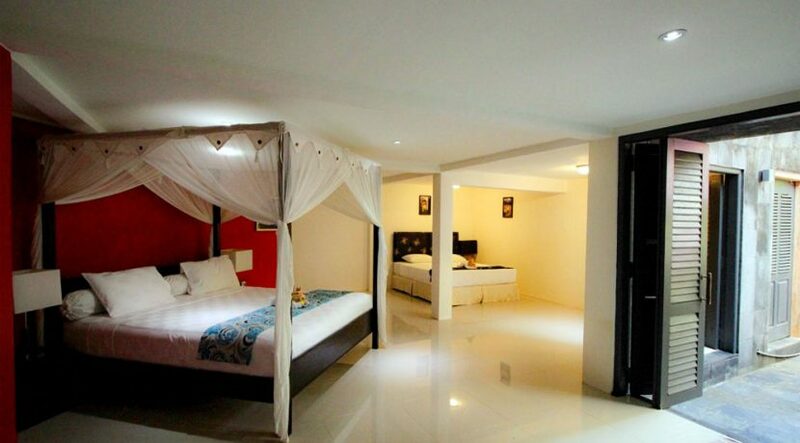 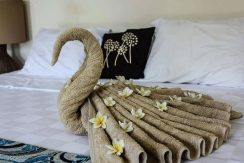 Lovina villa for sale: The main villa has 2 floors. 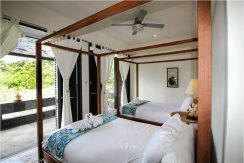 On the top floor are two separated bedrooms with large balconies, a lobby with access to the spacious entrance and parking. The bottom floor houses a brand new room (completed May ’17) of over 85 m² with loads of natural light, garden & pool views, balcony & an enormous en-suite bathroom with dual hand basins and a large open shower, toilet, et. 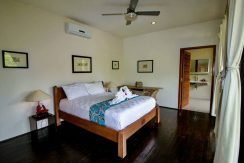 There is a separate walk-in robe with safe, luggage rack nook, desk, 1.5 Kw AC, & sitting room area. 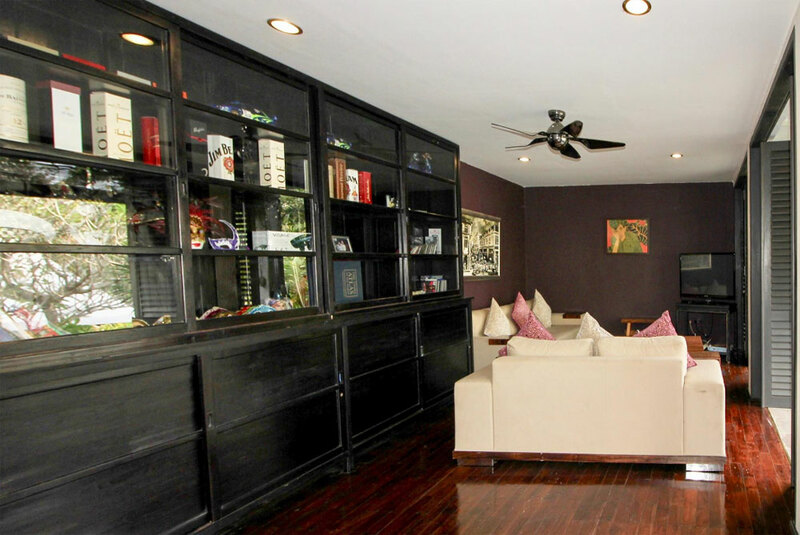 Also on this ground level is the living room and reading / TV/games room with large couches, flat screen TV, etc. 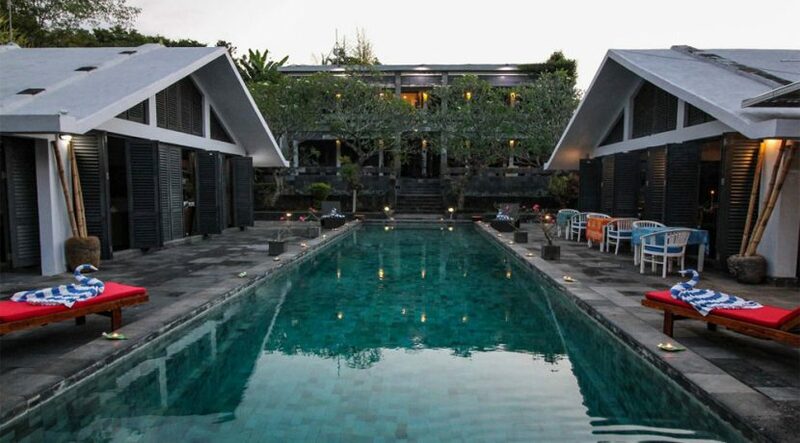 On the central level are two pavilions of 80 m² each, with a large 18 m x 5 m marble tiled pool in between. 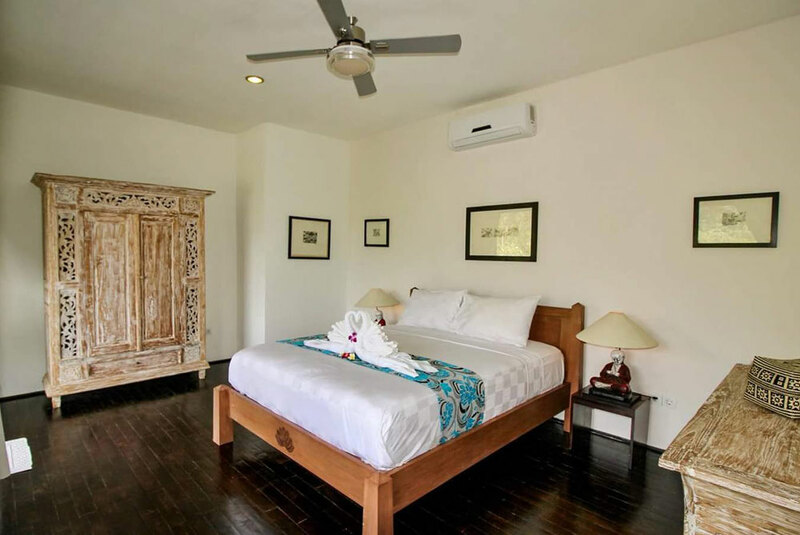 One pavilion gives room to a large western style equipped kitchen with dining, pantry, powder room/toilet, large gas oven/cook top & alfresco dining area with wall mounted flat screen TV, lighting, ceiling fan, etc. & views out over the gardens & pool. 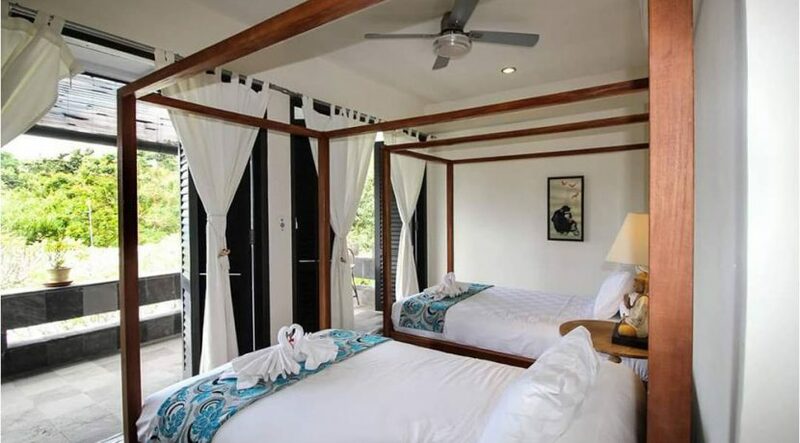 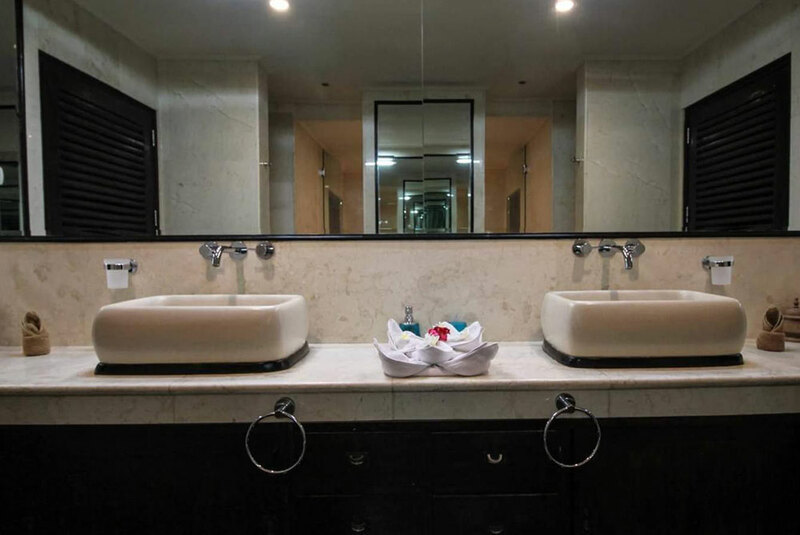 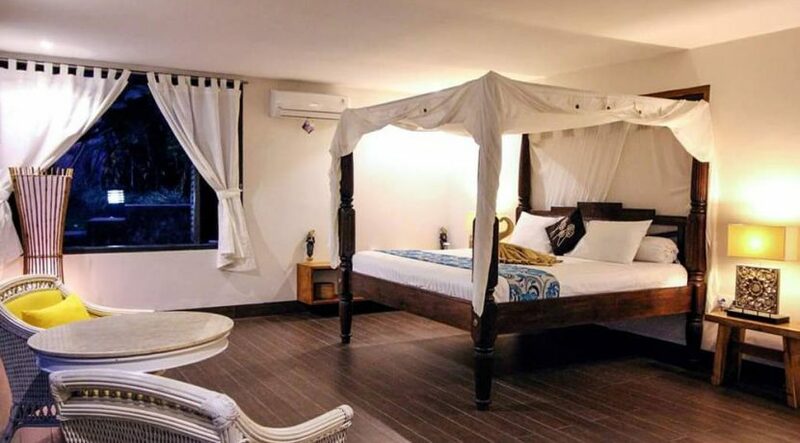 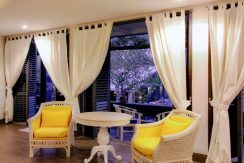 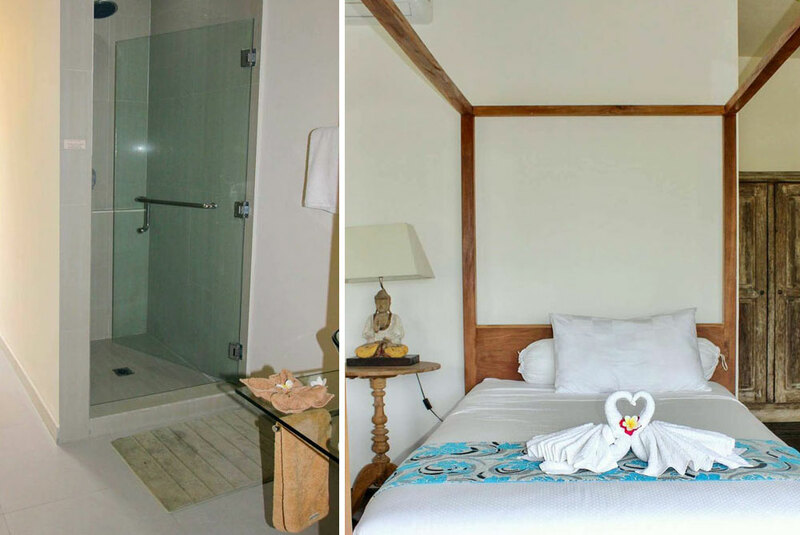 The other is a super large pool pavilion with plenty of wardrobes with room safe and large marble lined bathroom with twin hand basins, large twin door shower, toilet, etc. 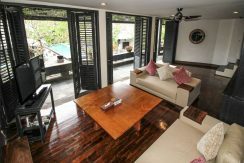 On a lower level is a fifth and very large family room (over 90 m² with extra-large en-suite & storage, a king size & queen size bed & private courtyard terrace. 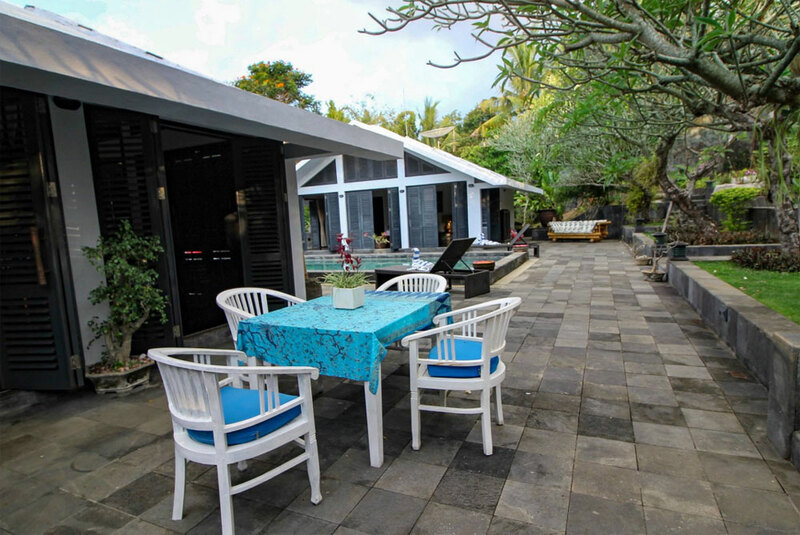 A new 2 Kw air conditioner & private terrace/courtyard. On the other side of the pool, below the kitchen area, is a fully self-contained apartment with bedroom, sitting, dining, new kitchen, large ensuite & walk in robe. 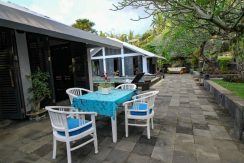 Immediately outside is a semi-private landscaped courtyard with good sized sitting area, water feature and growing privacy wall. 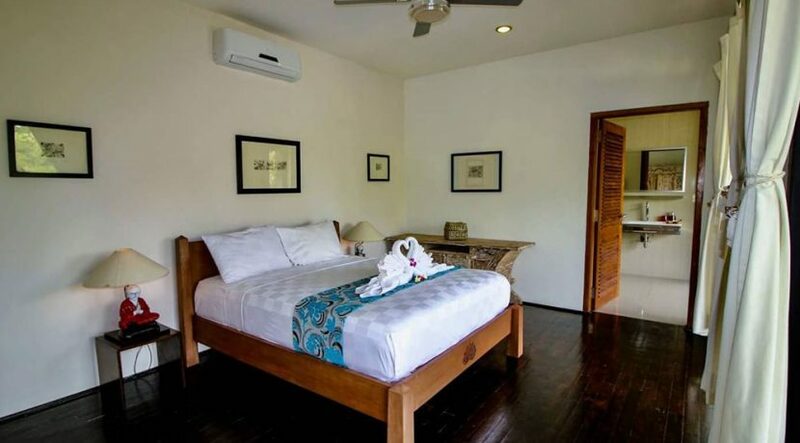 This brand new room can be let as another private room, used for an on-site management couple or for you to occupy as you operate your successful 5 or 6 bedroom holiday rental business. 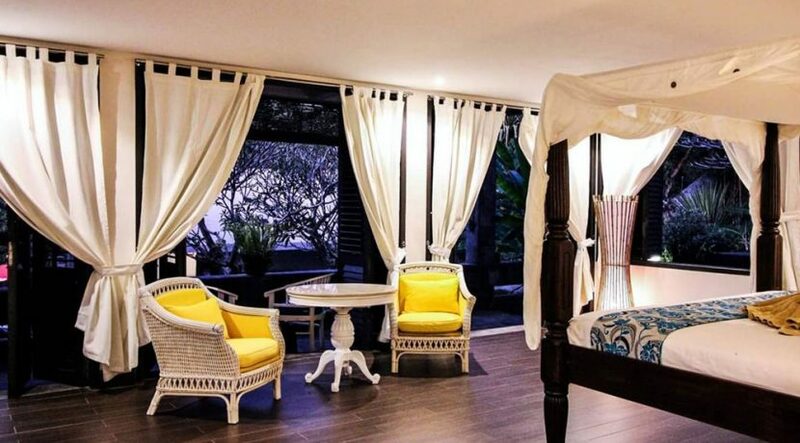 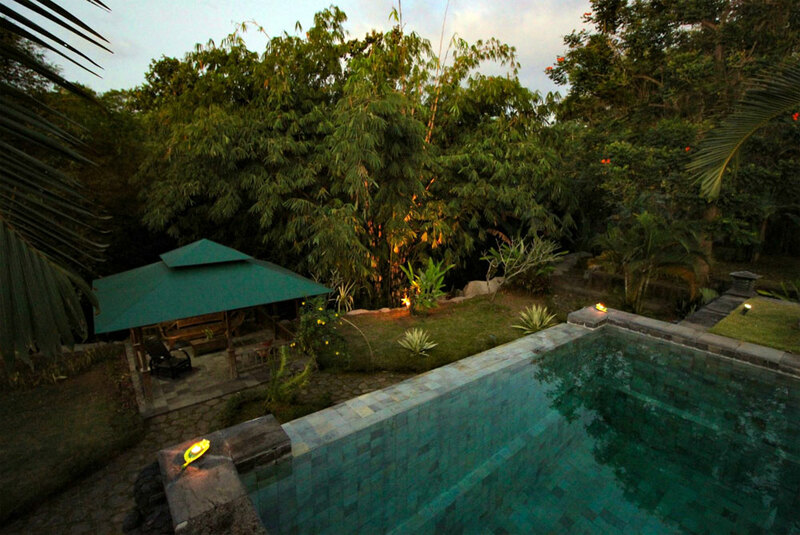 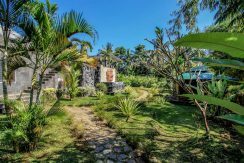 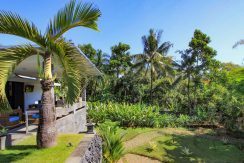 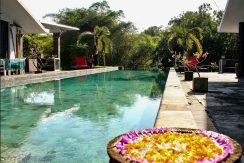 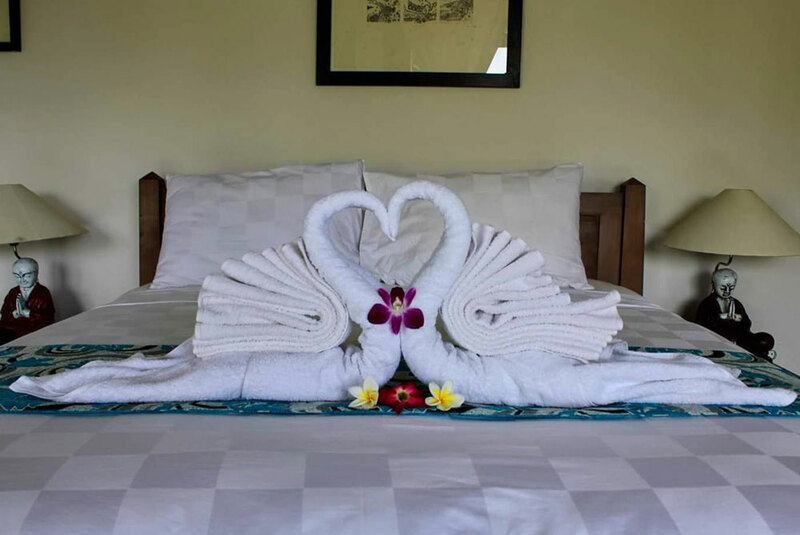 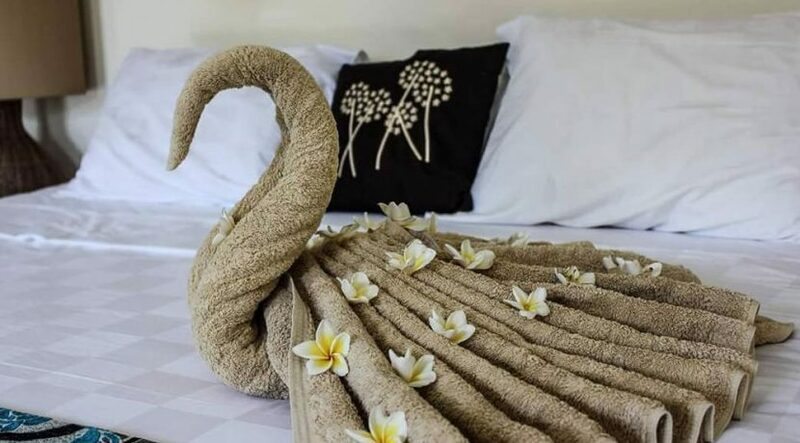 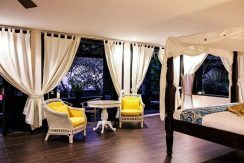 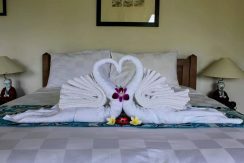 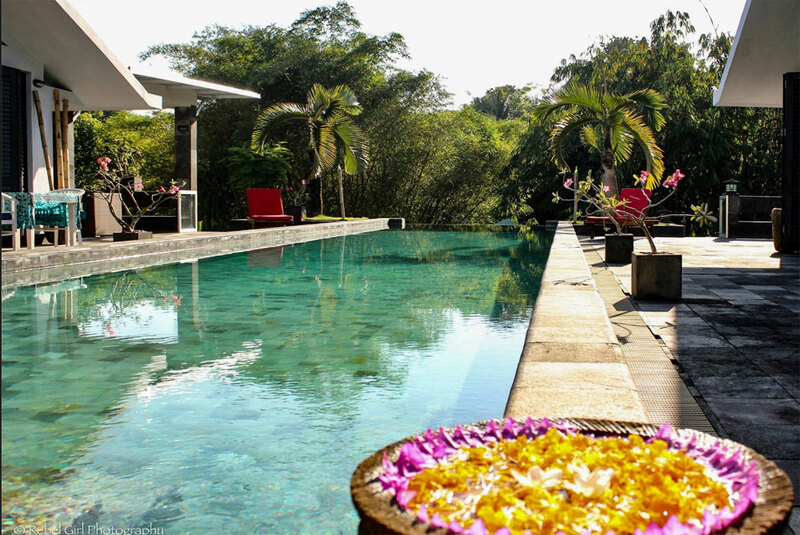 In the beautifully landscaped gardens of the property is a recently renovated Balinese hut, perfect for Yoga or massages or just to sit & read a good book. Complete with ceiling fan, lighting, blinds,& seating. 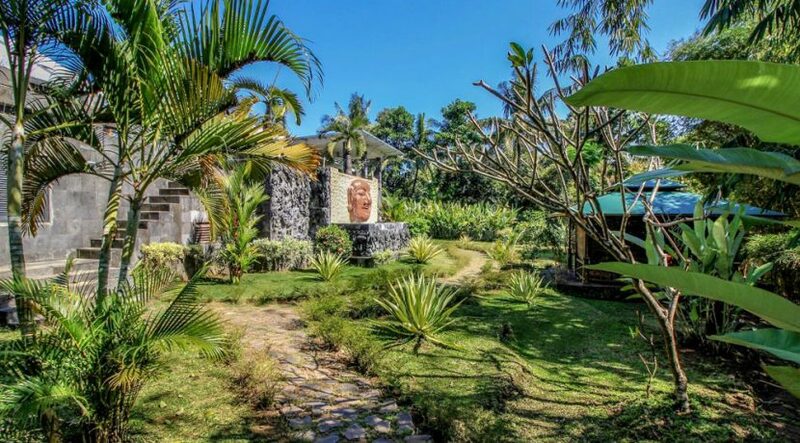 This property is unique for many reasons. 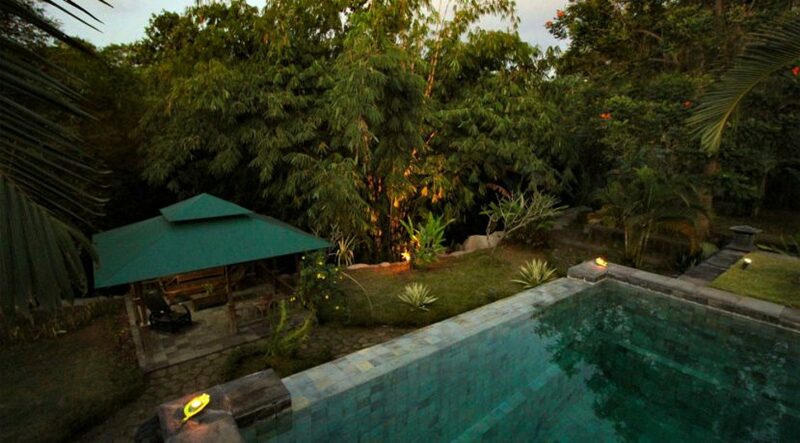 It was built using concrete & steel and therefor is low maintenance & termite free. 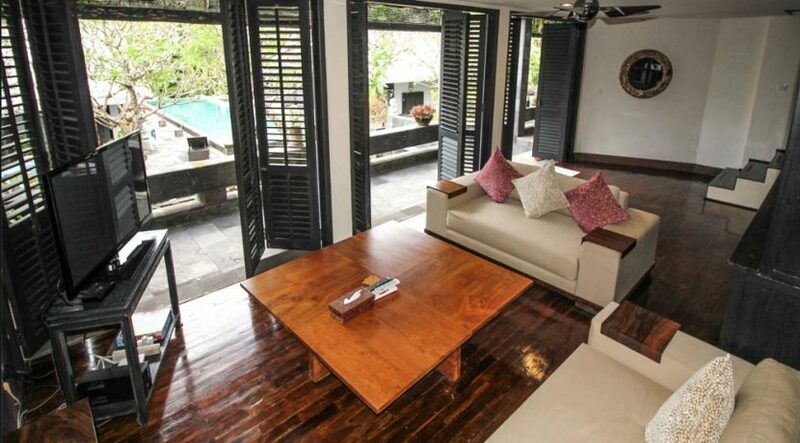 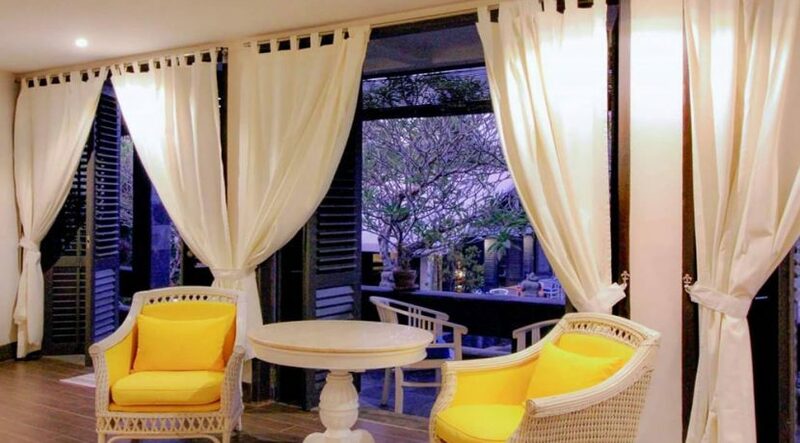 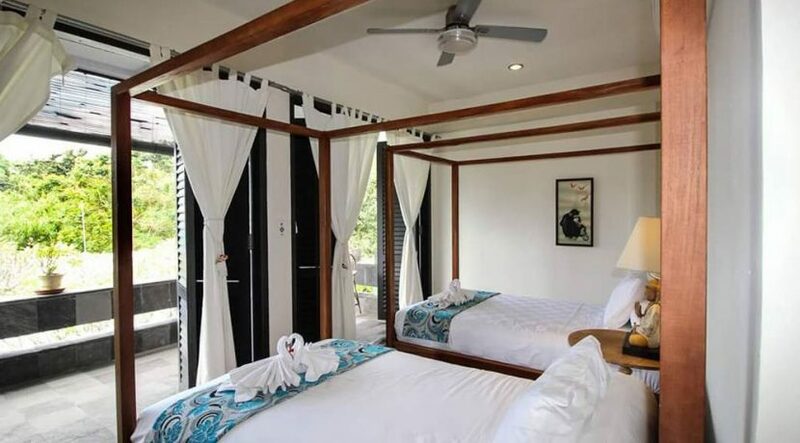 Use of plantation shutters rather than sliding glass doors gives the villa’s a wonderful island holiday feel. 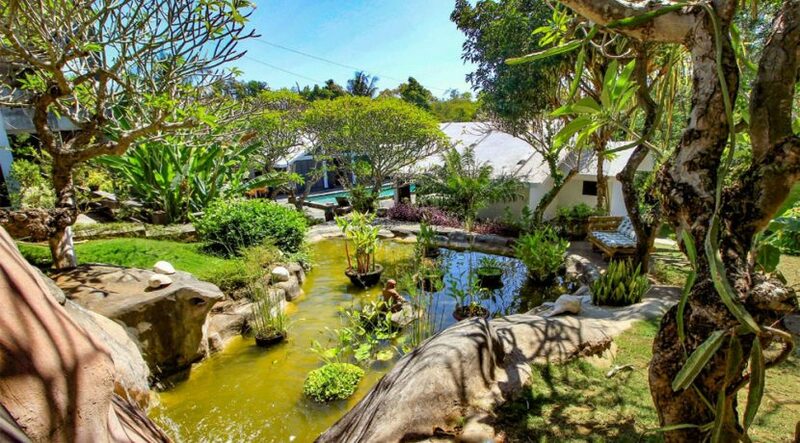 The property has a thick file of environmentally sound credentials including: over 180.000 litres of underground concrete water storage tanks which collect rain water; high end filtering systems so you can drink the water safely from all house taps; Eco filtration ponds for clear waste water after the septic tanks and into the river; 3 large fish ponds with filters, pumps & water features & much more. 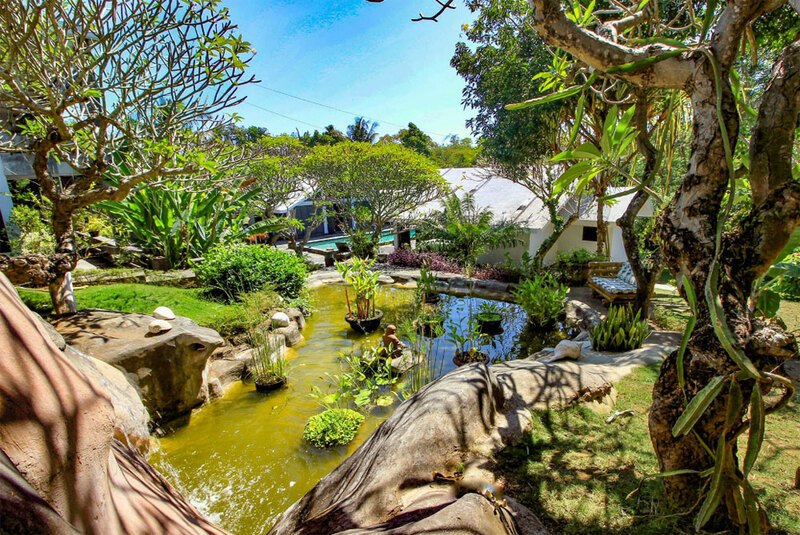 The magnificent gardens were installed by a well-known landscape artist from Java in 2010. 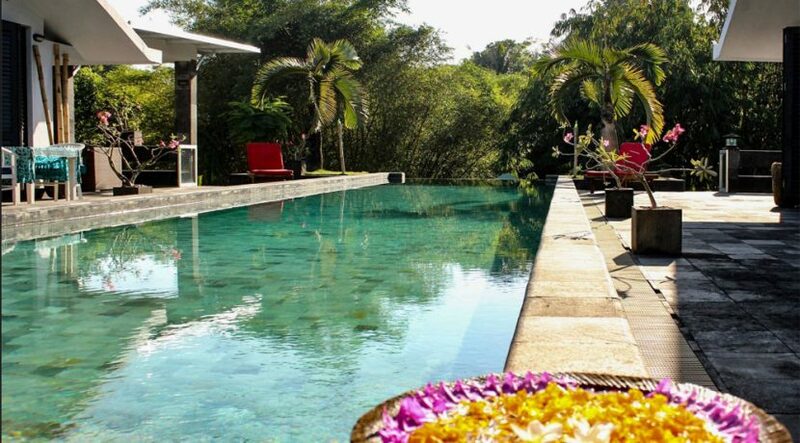 He has included many flowing layers, retaining walls, paths, wall carvings & a giant Buda statue over which the infinity pool cascades it water. 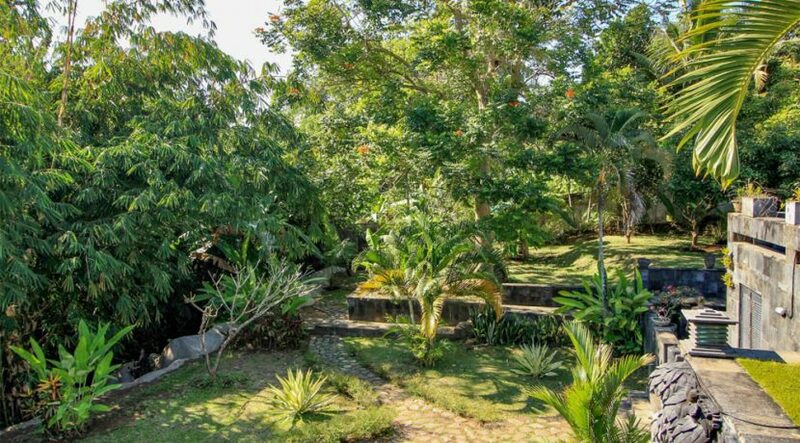 Many species of local & imported plants, shrubs fruits & now mature trees were planted with wonderful results. 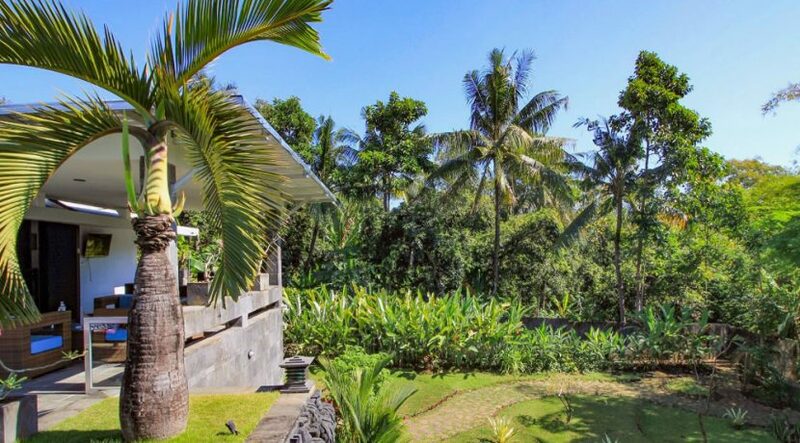 The property has an IMB (building permits) & Pondok Wisata (rental license) and permits & drawings to build 5 new 1 & 2 bedroom private villa’s on the site. Own car park with carport & security guard house. 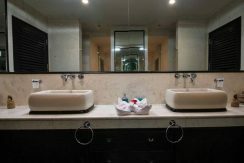 Recently installed CCTV system allows viewing & recording of activity 24/7 from anywhere in the world. 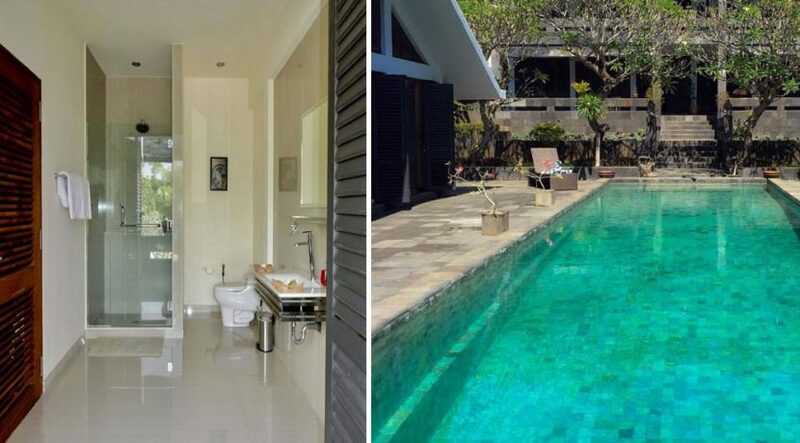 In late 2017, this property attained the “Certificate Of Excellence from Tripadvisor” & “Superhost” status from Airbnb. 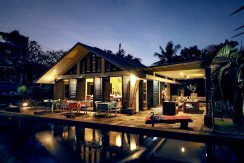 Quite an achievement in only a year from commencing operations as a holiday rental Villa. The formal announcement in August 2017 of the new International Airport to be constructed in North Bali will position this sensational property within a 30 to 40 minute drive from this new facility which is expected to require accommodation far in excess of what the area currently has available. 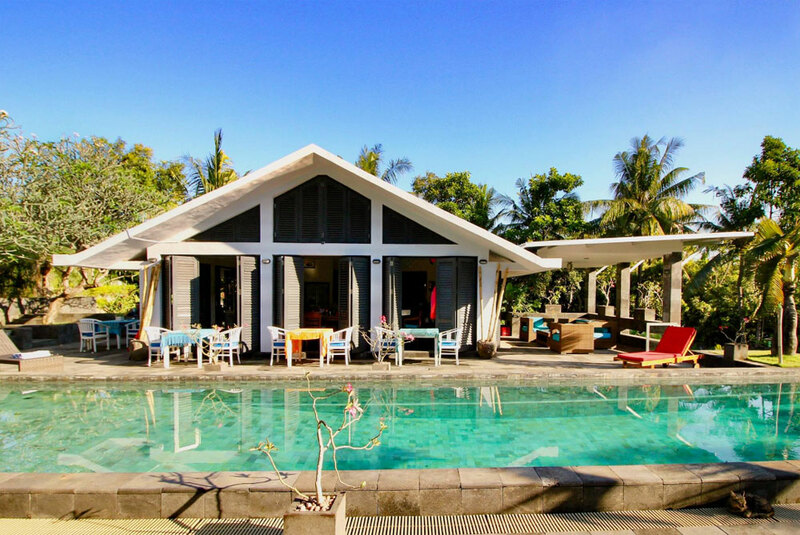 Lovina & North Bali have experienced consistent growth in tourism over the past 6 years and the future is guaranteed to explode with the Indonesian Government aiming at attracting over 20 million tourists per year by 2020. Current numbers fell short in 2017 to only 14 million or so. 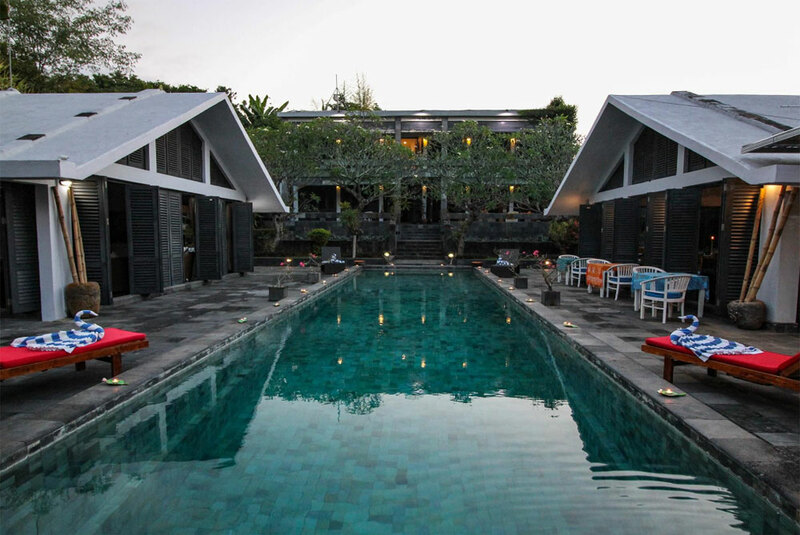 Over 80% of these massive numbers are arrivals into Bali. 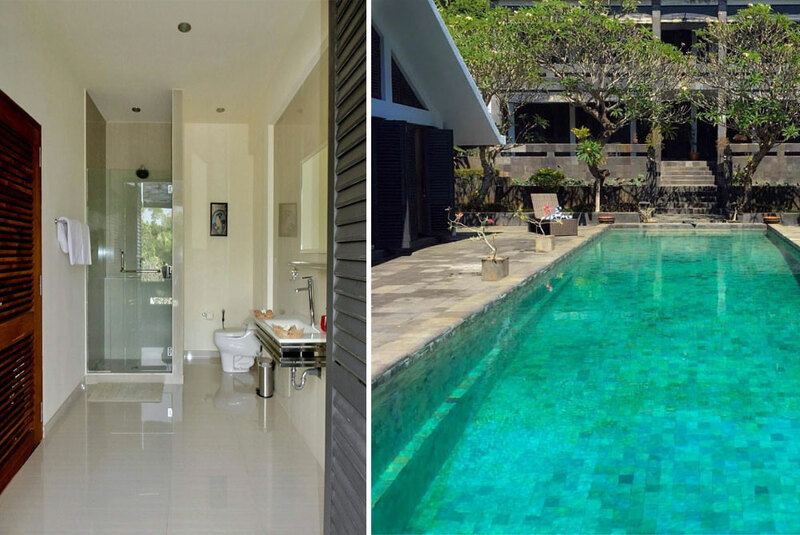 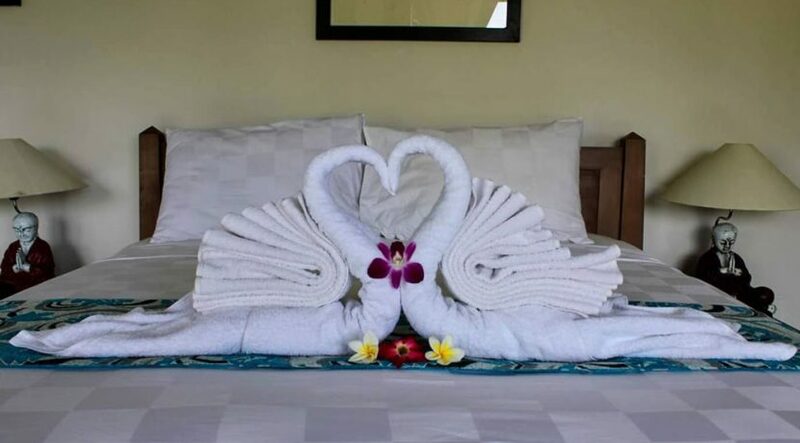 Whether you’re seeking a paradise to live in or one with an income with a decent ROI, Le Mirage Villa Santai (Indonesian for RELAX) offers you both. 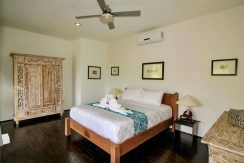 Any of the 5 main rooms can be transformed into other uses like a study/office, a gymnasium, art studio or hobby rooms, library, etc. 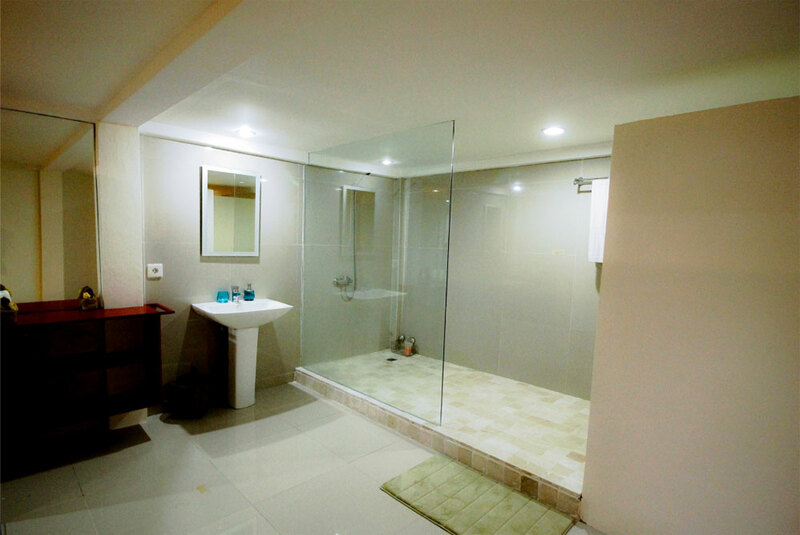 There is a large laundry & storage room, a workshop with storage, tools, etc. 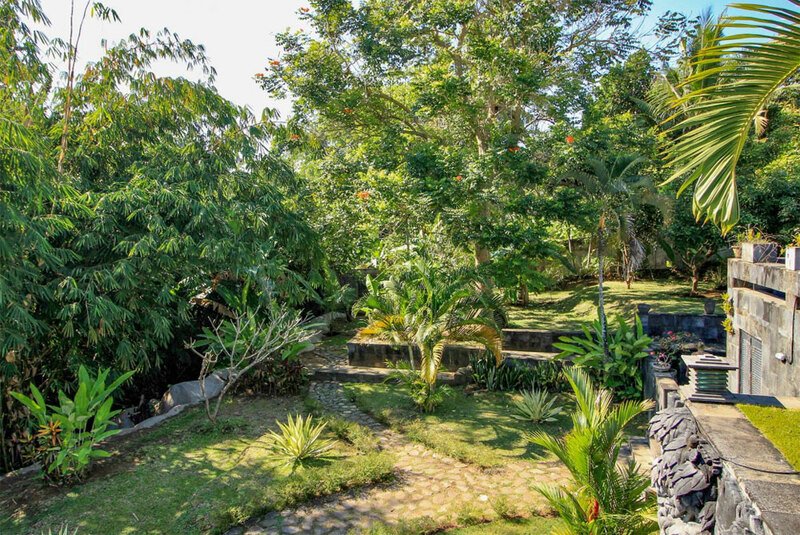 The property is low maintenance now, has all been recently renovated to the highest standards & includes all the facilities & infrastructure required, including 13,500 watts electricity input, to live a grand lifestyle without any concerns. 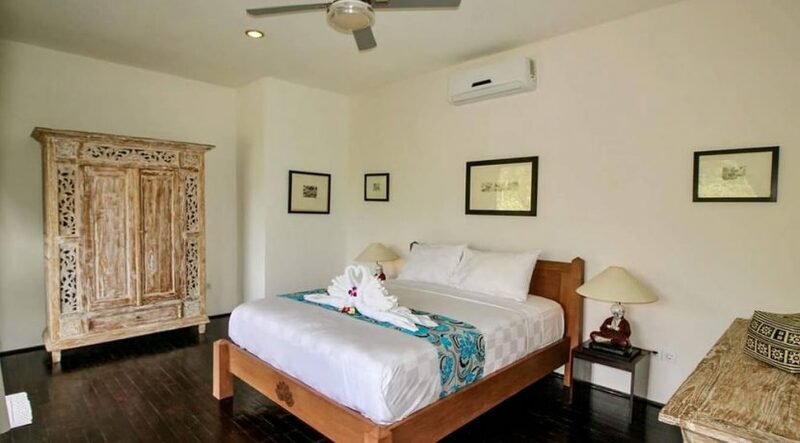 Low running costs due to upgrades in electrical fittings (all LED lighting, energy efficient AC units, pumps, etc) regular rubbish collections, improvements to the garden maintenance requirements and well trained & English speaking local staff (one has been here for 10 years) make this unique property a must see. 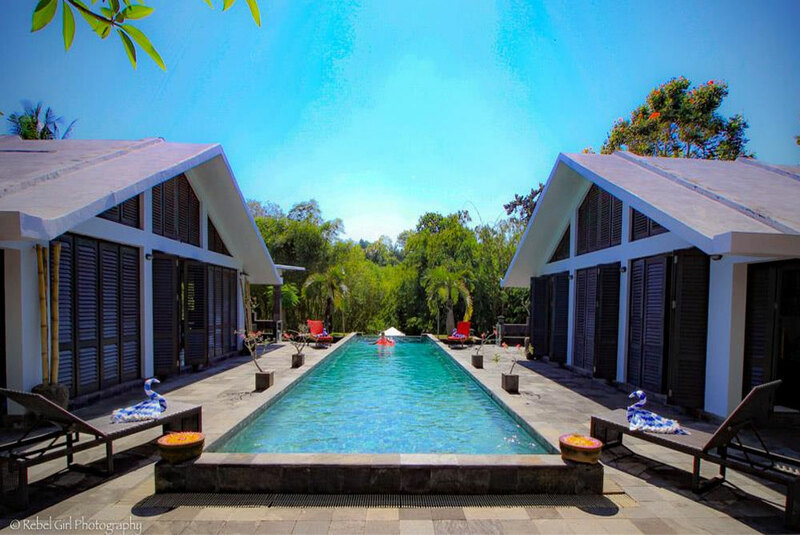 The property can be purchase as Hak Milik (freehold) or Hak Pakai (leasehold with a lease period of up to 75 years an options to extend) All certificates & documents to ensure a hassle free sale & purchase are available & current & any due diligence inspections are welcomed. 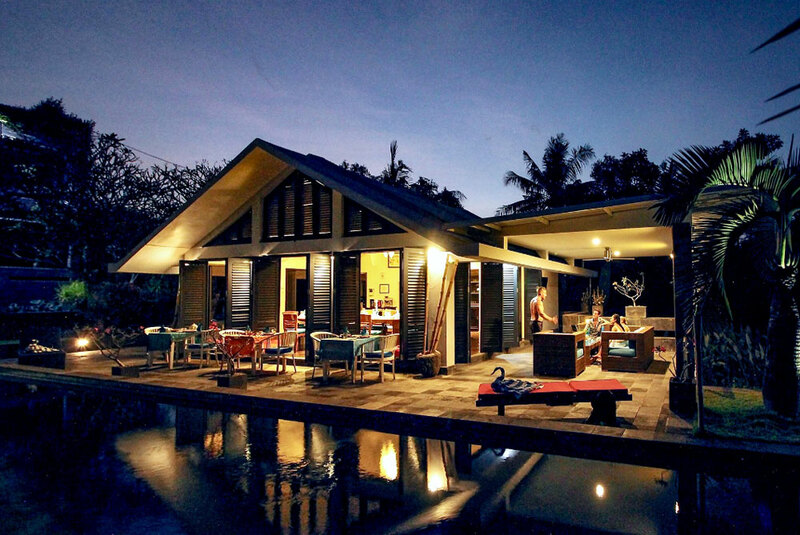 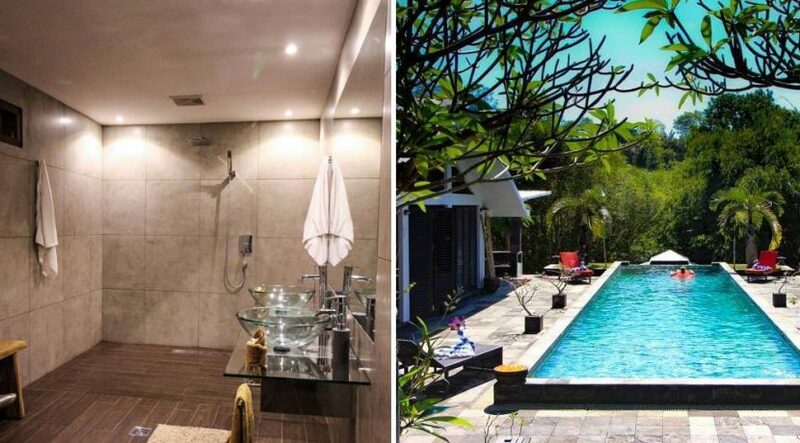 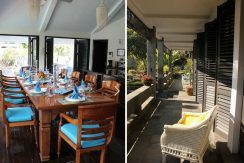 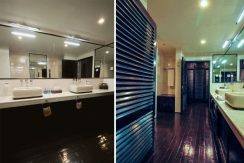 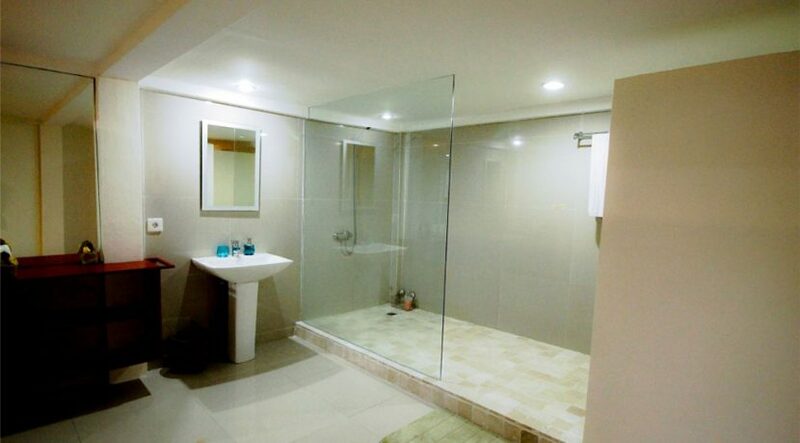 As operators of a successful construction & renovations company in Australia for many years and more recently as consultants here in Bali, we are acutely aware of the construction methods & materials used by most contractors here. Our search was for a property with soundly constructed buildings using concrete & steel (reinforced), sound foundations and quality fitouts. 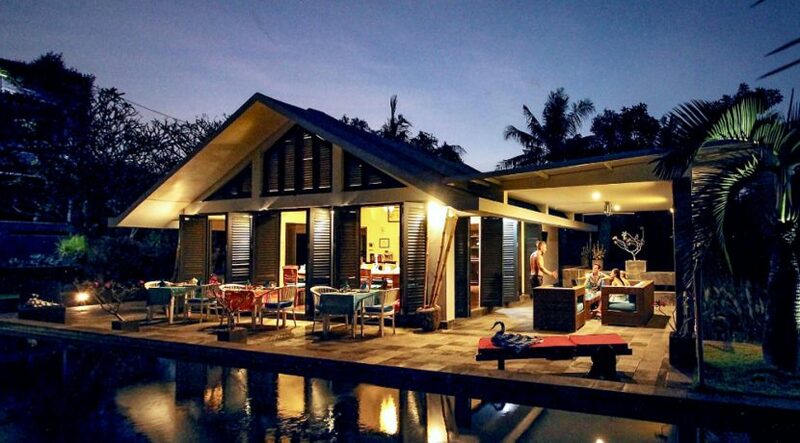 The original builder of this place over exceeded all these requirements as he built it to last as his own home. Exposed timber in North Bali is a nightmare waiting to happen. 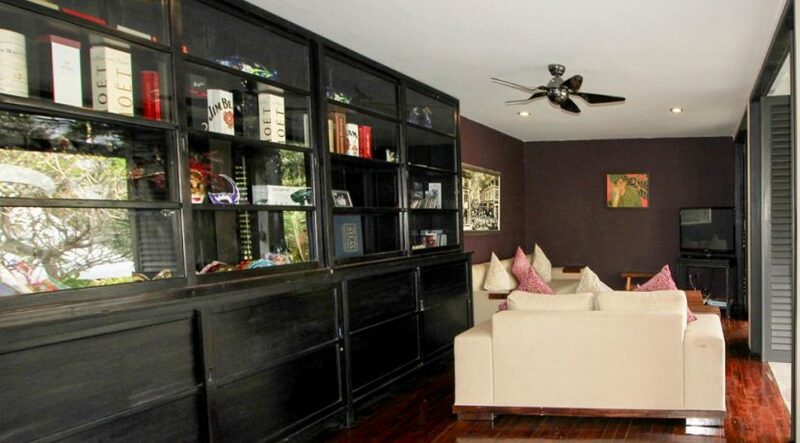 After a few years the only ones enjoying living in your home will be the millions of termites! 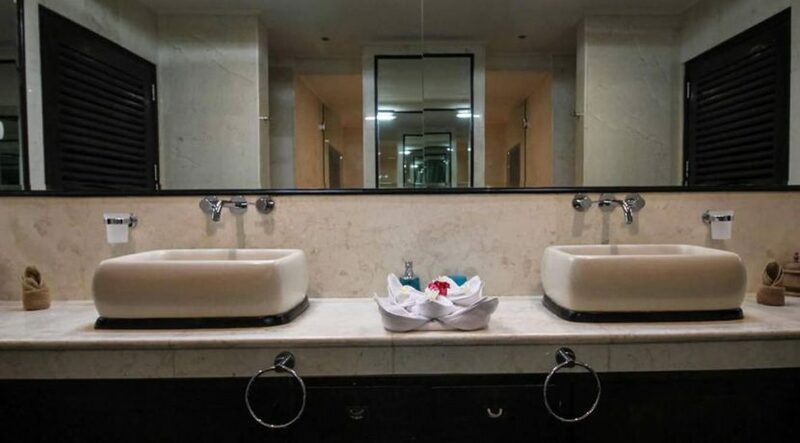 Not an issue here! 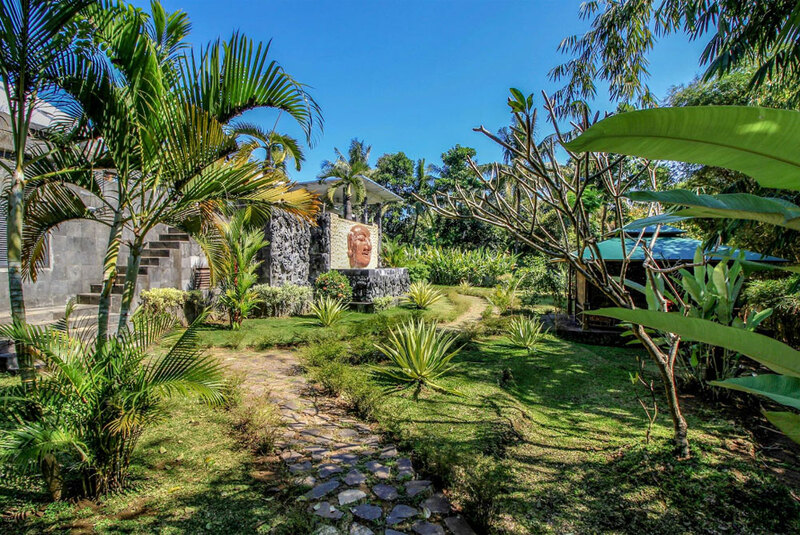 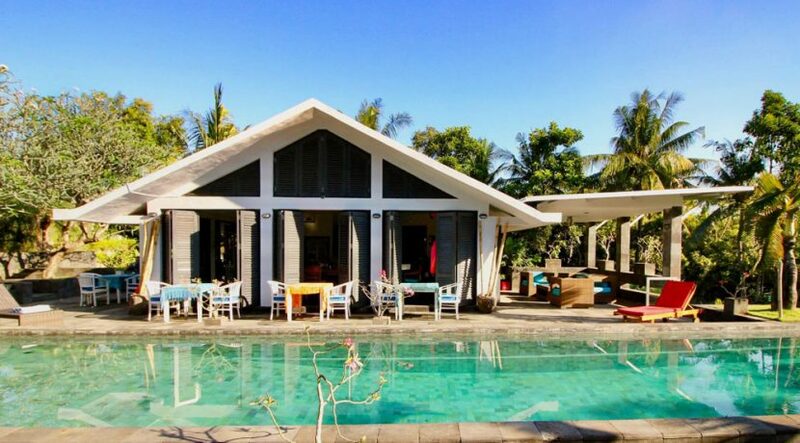 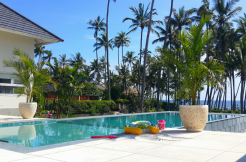 Lovina villa for sale: Please watch here a 360 degree movie (virtual tour) of this property!